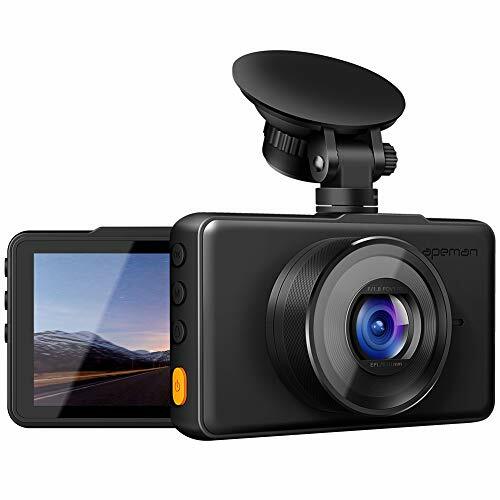 1080P FULL HD DASH CAM Simultaneous recording with Super High Resolution 1080P FHD Lens, and 3" large LCD Screen deliver clearer videosℑs and replay the key moment even when high speed driving. 170 SUPER WIDE ANGLE This car driving recorder employs 170 super wide angle lens. Ultra-wide field of view reduces the blind spots and captures more details, to reserve the real scene. BUILT IN G-SENSOR With built-in G-sensor, apeman dashboard camera can automatically detect a sudden shake/collision and lock the footage to prevent the video from being overwritten even in loop recording. Accident scene can be truly restored. SUPER NIGHT VISION The combination of F1.8 large aperture, WDR, HDR ensures the clarity of images at night. Eliminates the need for an auxiliary light source even in low-light environments, making it easy to obtain sharp, color-accurate images. EASY TO SET UP & USE Motion Detection, Seamless Loop Recording, Parking Monitor satisfy your need for daily driving. Simple installation and operation, no need to worry even for a first time user. Use a Class 10 micro SD memory card (Max 128GB) for reliable recording and performance. 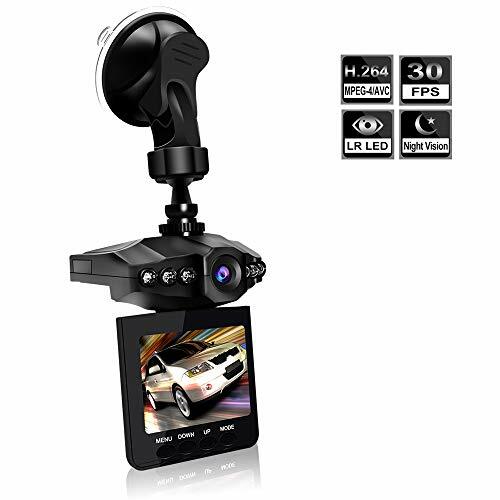 1080P FULL HD & 170 WIDE ANGLE Excellent 1080P Full HD resolution with 170 wide angle lens provides you with an outstanding picture quality with a wider field of vision effectively reducing blind spots, true record of every driving process. SUPER NIGHT VISION Equipped with the Advanced Sensor and F1.8 wide aperture, gathers more light and eliminates the need for an auxiliary light source even in low-light environments, making it easy to obtain sharp, color-accurate images, brings you a brighter night without as much light. Can insure clarity of image, even in the evenings. G-SENSOR & EMERGENCY ACCIDENT LOCK The built-in G-sensor technology automatically save footage in the emergency events for you, when collision or crash happens, preventing the authentic video sources from deleting. You can rest assured that your dash cam will capture critical details whether you are driving or letting it monitor your parked vehicle. LOOP RECORDING & MOTION DETECTION Intimate functions insure the SD card will never fill up and you will always be able to capture the latest footage, auto record and lock the video files if a collision or shaking to vehicle movement is detected, this takes away the worry of manually deleting files and saves important evidence in the case of an insurance claim. 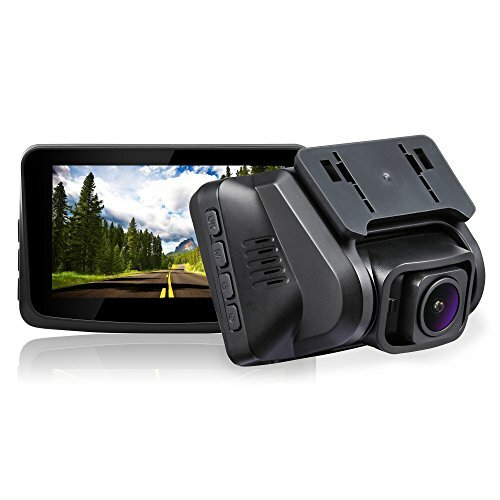 MINI SIZE & EASY TO USE C420 Dash Cam equipped with a 2.0''TFT-LCD screen,compact button design makes for easier operation, with the smaller size it is more aesthetically pleasing while also avoid blocking line of sight through both the windscreen and rear view mirror making it a more safer option whilst driving. Installation is about 2 minutes from box to window. 1080P@60fps Dash cam & 360 Swivel Angel Based on powerful Novatek NT96663 CPU and Sony IMX291 sensor, the 1080P dash cam captures road front in crystal details at 1920x1080P@60fps, capturing license plates clear. 360 Rotatable lens swivel in any direction, enable capture any special footage in front, outside and inside as well. Wifi dash cam & VAVA Dash Cam APP With built-in Wifi and VAVA Dash App(on Google or APP store), easily access to the configure, live stream, playback, download and share incredible HD video to the social media, such as Facebook, Twitter, Instagram, Pinterest and so on. Perfect Wifi car camera for taxis, truck, SUV, rideshare, lyft drivers, commuters, and families. Night Vision w/Sony Sensor & GPS Dash Cam Advanced Sony IMX291 sensor, F1.8 6-glass lens rear facing cam plus 1 IR LED lights greatly enhances night vision inside car at low light environment, making your driving more safer at night; Built-in GPS can accurately track the driving route, location and speed in either KM/H or MP/H. Seamless Loop Recording, G-Sensor & Parking mode Seamless Loop recording will record the video on 1 /2 /3 minutes clips and automatically overwrites the oldest clips with the newest videos; When the built-in gravity sensor detects a sudden shake or collision, the video will not be overwritten; Auto switch the dashcam to Parking Mode, triggered by the collision sensor, the dash cam will automatically record when people hits your car. 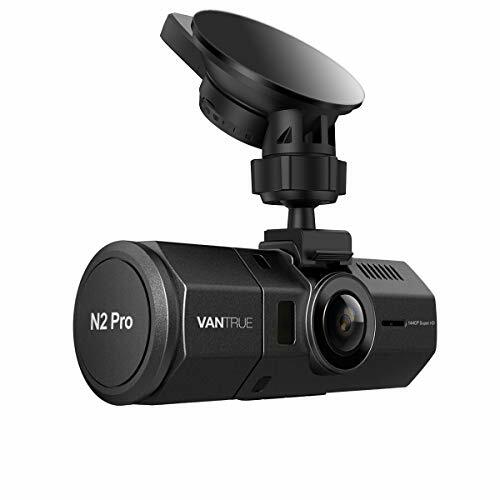 Compact Design & Super Easy Installation Low-profile design allows the VAVA Dash cam to be a well-hidden witness to the road ahead; Equipped with strong suction cup, enables install the dash cam to vertical or normal windshield. Works with 12V and 24V vehicles such as car, suv and trucks. Full 18m Warranty, email replies within 24 hours. Dual Lens Dash Cam For Uber Lyft Taxi Best dash cam to record car interior picked by Wirecutter. Based on powerful Novatek NT96660 CPU, advanced Sony Exmor IMX323 sensor (inside car camera) and OV4689 (front car camera) sensor, the front and inside camera simultaneously capture the road front (170 ) and inside passenger cabin (140 ) in crystal details at dual 1920x1080P 30fps. Or utilize the front cam only to record road front at 2560x1440P@30fps or 1920x1080P@60fps to capture license plates. Infrared Night Vision w/Sony Sensor The interior facing camera utilizes a Sony IMX323 sensor, 4 IR LED lights and f/2.0 aperture, which can handle low light conditions and ensures flawless video footage even when the passenger cabin is dark. F/1.8 6-glass lens front facing cam and unique HDR video system automatically balance the light and dark areas of the video. 24 Hours Parking Mode & Auto LCD OFF 24 Hours Motion activated parking mode makes the dual car camera to automatically record when it detects motion in front of your car. Auto start and record when the ignition sparks up. Auto LCD OFF timer ensure you won't be disturbed by another glowing rectangle on your windshield. Ideal for most climates: -4 to 158 F (-20 to 70 C). Excellent audio recording with built in microphone. Time lapse function automatically takes photos at specified intervals. Looping Recording & G-Sensor & Optional GPS Seamless Loop Recording overwrites the oldest footage with the newest upon filling a card to capacity. Variable sensitivity G-sensor auto detects sudden shake/collision and emergency locks the footage to Event File to prevent that video from an overwrite. Supports up to 256GB microSD cards, recommend samsung evo card. Optional GPS to track the driving route, location and speed(To use GPS function, please buy an extra gps mount Asin: B07CYW6JXW). Total Peace of Mind w/18m Warranty Full 18m Warranty, email replies within 24H, and 100% Satisfaction Guarantee. Pay less auto insurance, your witness for accidents and insurance claims. Perfect dual lens dash cam for uber, taxis, rideshare, lyft drivers, commuters, and families. Works with 12V and 24V vehicles. The OnLyee Dash Camera utilizes 6-layer fixed-focus with full-glass elements to capture high-quality 1080p footage at 30 frames per second with a 170 wide-angle lens taking in every detail. With a 170-degree viewing angle, you can record traffic in 4 lanes. The condition of the entire road can be clearly understood. And also you can discreetly mount the camera nearly anywhere on your windshield and still capture the entirety of the road without blind spots. When wide dynamic range function is turned on, whether the scene is particularly bright or particularly dark, can see clearly. The camera automatically adapts by fine-tuning the exposure of the camera to create balanced images and footage in any light condition. By Loop Recording, when the memory card is full, the new record will automatically overwrite the oldest record,and the locked video will not be overwritten. When the G-sensor detects a collision, the current video will be locked, ensuring that your most important video is protected. another glowing rectangle on your windshield, you can also turn this function off if you prefer the screen stays on. when you don't drive for once power is disconnected, the dash cam will shut down after 30 seconds. 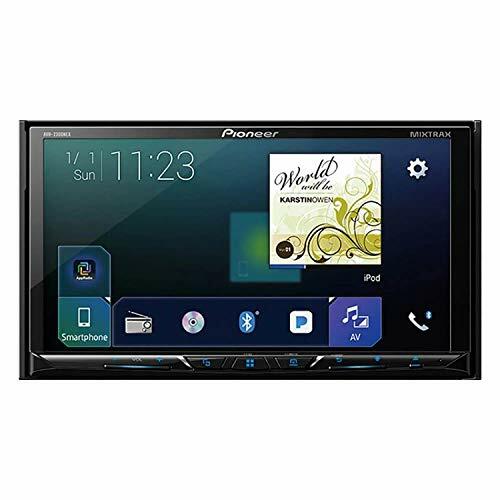 3" LCD Large SCREEN WITH 854*480 PIXEL & AUTO ON/OFF 3" 16:9 LCD wide screen has reached 854*480 Pixel, which is 4-5 times that of average brand dash cam with 2.7" display, enables you to monitor a broader field of view while driving on the lanes. Dash cam will automatically start continuous recording once car engine starts and turn off while you shut off the car. 170 WIDE ANGLE & 6 LAYER FIX-FOCUSED Full Glass & 80 Rotatable Degree Lens 170-degree wide angle of view enables you to monitor boarder fields of whole 3 lanes while driving. another bonus, allowing you to rotate up-to-down lens within 80 degrees to capture more visible views. 6-layer fixed-focus with full-glass elements provides better light transmission and will record LCD TV-like video. G-SENSOR & EMERGENCY RECORDING & WDR Build in G-sensor technology, automatically locking the critical footage of emergency to prevent the video from being overwritten even in loop recording once collision or car accident occurred. clearly providing what happened to police as evidence for reimbursement. And the WDR function enables camera automatically adjust by bumping up or down the exposure to produce balanced images and videos in strong daylight or dark night. EXTREME TEMPERATURE RESISTANCE & BATTERY BACKUP OnLyee Dash Cam can operate in extreme climate range from -5 to 150 -just stick it onto the windshield and forget it, it will automatically record every moment along with you on the lanes. An internal battery is included for emergency file back up in case of USB power supply disconnection for maximum 15 minutes. Not only a car driving recorder DVR as well as a parking monitor for your car and driving safety. Dimension: 2.68 x 1.5 x 0.98 inch. A small personal alarm is a smart way to protect yourself from potential harm. User friendly design for all ages. Built-in LED lights for low lighting emergency environment. Such a small fashion project will not cause the attacker or intruder's attention. It is also the family, friends, lover's perfect gift. When the alarm sound goes low, please remove screws from back cover and replace new batteries. This item is not completely waterproof, please not put it in the water and make it in a dry condition as possible. DUAL CHANNEL, WEATHERPROOF REAR CAMERA: 4.0" FULL HD 1080P 170 degree front camera + VGA 120 degree rear camera, obtain full lane coverage, shows the things more and can switch among back lens/front lens/both front and back lens display. When backing your car, the rear camera will automatically open reverse image. The camera's emergency detection automatically records events when a collision is detected using G-sensor technology. Full coverage of three lanes. The powerful F1.8 aperture combined with an extremely powerful 3.0 m x 3.0 m image sensor guarantees excellent pictures even at night. HD and first-class night vision. 1920x1080p at 60 fps captures fast-moving scenes and creates high-resolution images at high speeds. At 30 fps, a resolution of 2304 x 1296p Ultra HD is possible. Note: A microSD Class 10 card with 8 - 64 GB and higher is required (sold separately). Using the built-in screen or the YI Dash Cam app, for Android and iOS, makes the operation simple. Large buttons and user-friendly icons allow quick and intuitive navigation through the menus and settings. 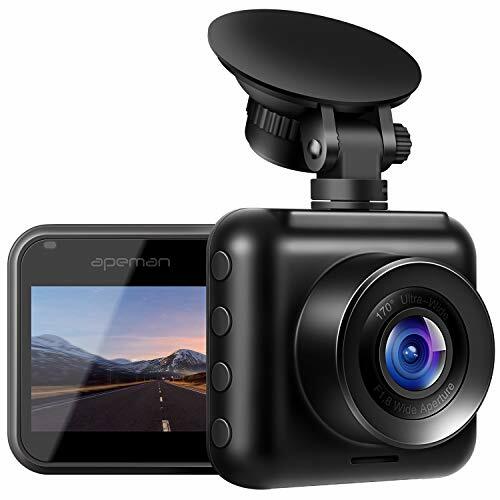 Apeman C450 Dash Camera Functions: > Motion Detection--Auto recording when detecting a motion, less power and less storage space to capture the crucial footage. > Parking Monitoring--Under Parking mode with power off, auto turning on and recording when detecting a vibration, to keep your car's safety. > Gravity Sensor--Detect significant or sudden movement and automatically lock files in the case of an event triggering the sensor. > Loop Recording--24 Hours Loop Recording, create video clips, automatically overwrite the oldest file to save the current file. Specifications: > View of Angle: 150 wide angle > Maximum video resolution: 1080FHD (1920 x1080) > Maximum resolution of the photo: 12M (4032x3024) > Photo Format: JPEG > Power supply: 5V / 1.2A > Support SD card: Micro SD card, class 10, no more than 32GB Packages: > 1 X C450 Dash Cam > 1 X Mini USB Cable > 1 X Suction Mount > 1 X 3M Mount > 1 X Car Charger ( Input 24V/12V, output DC 5V/1.2A) > 1 X User Manual Warm Tips: > 1. The internal battery is small capacity for backup only. You need plug the car charger while use it; > 2. Please format SD card on your dash cam before using; > 3. SD card is not provided in the package; > 4. 30 day money-back guarantee and a 12 month product warranty. 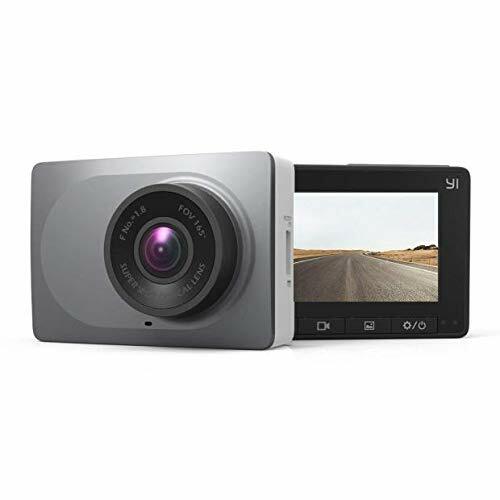 1080P Full HD/3.0 inch LCD C450 Dash Cam with maximum FHD 1080P supporting 4032x3024 photos, to let you enjoy 12MP high resolution video.Ultra Clear 3.0 inch LCD screen and 170 wide angle to enjoy more clearer and broader visual experience while driving. G-sensor/Motion Detection When built-in gravity sensor detects a collision, the current video of dash cam is locked, ensuring important footage is kept protected from being overwritten.Automatically record once detects moving subjects with 3 meters in front of the 6G lens to avoid emergency. Excellent Night/Day Vision Car dash camera combined with big aperture and wide dynamic range(WDR)/HDR ensures the clarity of images at night even though in low-light environments. Framing from a wide degree angle to avoid video shooting blind area and bring you comprehensive and superior recordings. Seamless Loop Recording Cyclically record new videos under the time interval you set and automatically overwrite the recorded unlocked videos to extend the life of the memory card of dash camera and record the bits and pieces while driving. Easy to install/Warranty Easy to install and operate, just plug in the SD card (not included) and connect to the power supply. 45-day money back guarantee, replacement on 12-month quality problem, 24-month warranty period. 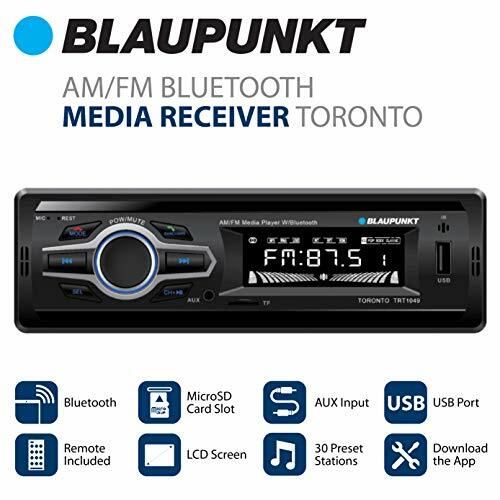 The Blaupunkt AM/FM Bluetooth Media Receiver features an AUX Port, SD Card Slot, USB Port, RCA line out, and Bluetooth capabilities. With up to 30 Preset Stations, you\'ll keep up with all of your favorite stations and once you download the app, you can control the whole thing from your phone. There also comes an included Remote Control. delivers clear phone calls and rapidly charges your smart device! gear stick while driving. Experience the optimized viewing comfort while you drive. Quick to answer, hang up, refuse, cancel a call via the middle multifunctional button. "CH" Button enables you to switch to a private call to meet your demand. fm transmitter frequency to be the same frequency as that of the car radio. gradually. Long press to adjust the frequency quickly. Voice Navigation With this bluetooth fm transmitter, you can get clear voice navigation from your phone's app. It will self-adjust volume for navigation when playing music. No more hassle but full of exploration on your trip. Clear Music From 4 Play Modes Stream stereo music freely in 4 ways: A: U Disk ( 32G); B: TF Card ( 32G); C: Aux Input (via the included 3.5mm Audio cable); D. Bluetooth Connection. Compatible with Samsung, Sony, Android devices, iPad, MP3 player, and other Bluetooth-enabled devices. Fulfill your trip with your favorite music. Power ON/OFF and Efficient Charging This bluetooth car transmitter can be plugged in to power on and unplugged or long press the CH button to power off. One 5V/2.4 A USB charging port charges your smart device quickly. The other USB port supports reading U Disk up to 32G. Free to enjoy music and get smart device full charged. Easy Switch from Hands-free Call to Private Call Bluetooth 4.2 technology offers more stable connection and consumes less energy for clearer and hassle-free calls. 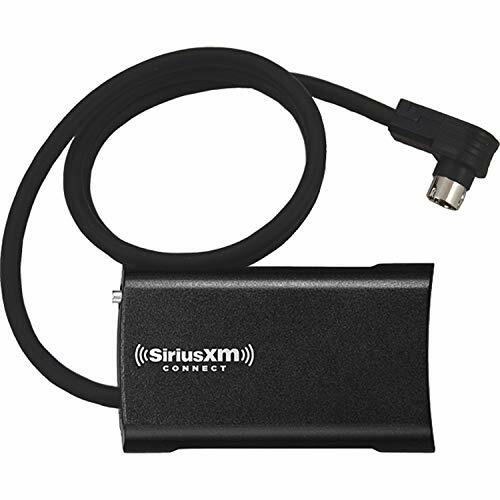 This bluetooth radio transmitter is easy to switch to a private call when receiving a call by pressing the CH button. Soft and Clear LED Display Easy and comfortable to view volume, car voltage and FM frequency displayed on the LED screen. 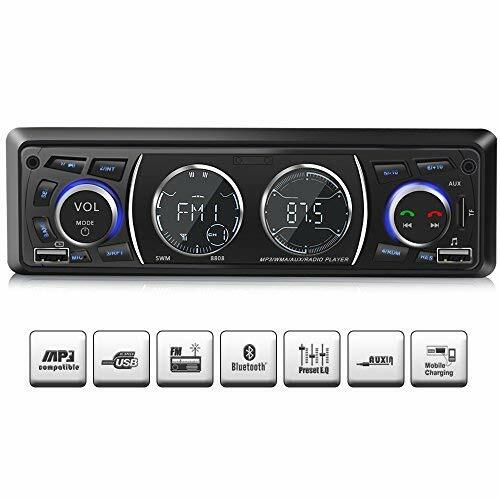 This fm radio transmitter help you always stay concentrated on your drive and reduce eye fatigue. DuDuBell dash cam is a necessary partner with you all the way. Any emergency occurs, you also need this dash cam! It will record and lock the video automatically for your convenience, nothing will miss. 1. Please format the SD card before before using. Please be sure to use a high speed Micro SD card, maximum support 32GB, minimum support class 10(not included). 2. The red wire of the rear camera should be connected with the positive lead of reversing light. 3. The default rear camera extension cable is 6m, it is too short to be used in truck or bus. 4. Every product of DuDuBell comes with 12-month warranty. For any question, please feel free to contact our technical support engineers via support@dudubell.cn. [Touch Screen & Crisp Recording] Left-side touch screen is more suitable for US drivers to operate while driving; High resolution with HDR technology allows to capture everything in great detail to bring you a better viewing experience. [Enhanced Night Vision & Reverse assistant] 6 layers of glass makes recording avoid over exposure and helps to capture more details at night; The backup camera with IP68 waterproof night vision design will automatically display reverse image in any situation when the R gear is engaged(Please connect the rear cam red cord to your reverse light 12V postive lead). Also, the parking guide line will help you park more safely. [Dual Channel Recording & Wide Viewing Angle] Front and rear camera helps to provide a picture in picture viewing in 4.3-inch display screen; 170 degree Wide angle front lens and 120 degree rear lens will help to capture more important details on the road. The cable lengthen of rear camera is 19.68ft. 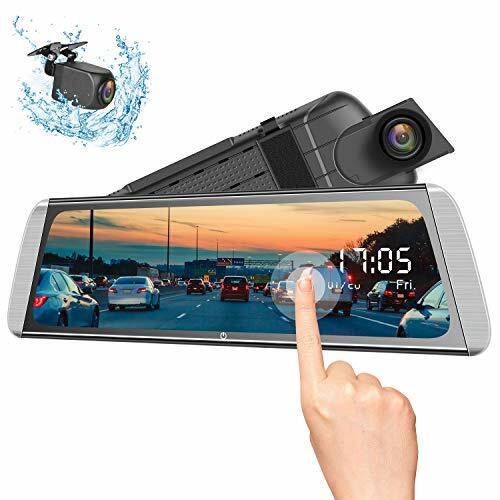 [Various Powerful Functions] This mirror dual dash cam is functioned with G-sensor, HDR, loop recording, motion detection and parking monitor. Here are some important recommendation to function settings for your daily using: G-sensor level to Low, loop Recording to 3min, Motion Detection to Off, Parking Monitor to On. [Warm Tips & Product Warranty] It's very convenient for you to install the mirror dash cam with reference pictures in our Manual. Please be sure to use a high speed Micro SD card, maximum support 32GB, minimum support class 10. Every product of DuDuBell comes with 12-month warranty, for any question, you can feel free to contact our technical support engineers via support@dudubell.cn. Use the suction cup mount to securely fasten the dash cam to your car windshield in seconds. Plug the car camera in the included standard car charger and connect the dash cam via the car charger cable to power on and instantly start recording. WDR: An advanced sensor technology of the dash cam, well-balanced exposure at night, this car camera makes night shots brighter and video image more clearly. 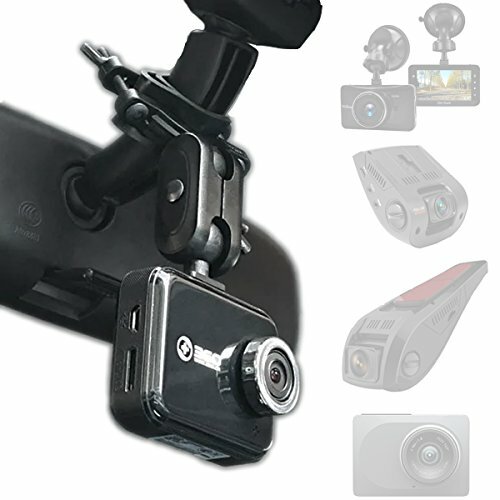 LOOP RECORDING: Seamless Loop Recording, this dashboard camera automatically covers the earlier segments in dash cam when the storage space is full. SUPER NIGHT VISION: The mode automatically balance the light and dark areas of the video in dash cam and this car camera generate high-quality images. Clear video evidence can be provided to police and insurance institutions. Remarks: GenLed dash cam comes with a full 18 month warranty, 30 days money back guarantee. If the dash camera or other car camera accessories do not work, please contact us for help. 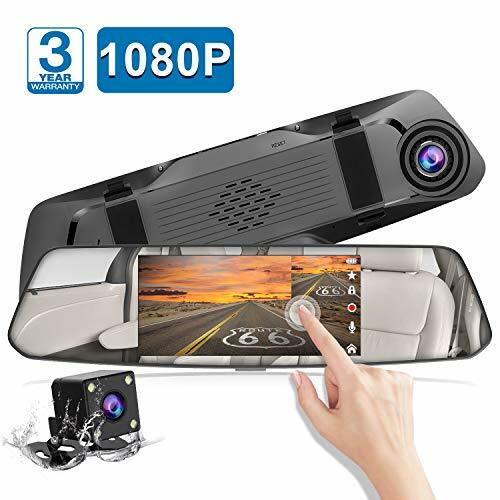 1080P 10 Inch Streaming Media Full Touch Screen The 1080P Streaming Media dash cam featured Full HD sharp colors IPS touch screen will synchronously display rear view viewing when car starts and present a clear and crisp video quality with high resolution in day or night. Ultra-Wide Field of View & OEM Looking The wide angle lens eliminates blind spots and alleviates the worry of recording everything happening in front and rear, which helps you drive at ease. Its original equipment manufacturer look makes the mirror dash cam perfectly integrate with existing mirror. Super Night Vision & Safe Parking Analogy High Definition of 1080P backup camera presents super night vision in low light conditions, and the backup camera display with guide lines assist you safe parking. It is flexible and convenient for you to adjust the view angle by sliding your finger on the touch screen when driving or reversing. Loop Recording & G-sensor Loop recording will automatically overwrite the earliest video segment when the memory storage space is full. With G-sensor enabled, it will automatically lock and store the video when it encounters a sudden shock and collision. Mirror dash cam provides video proof of an accident that happens to be capture by the recording. Easy Setup & Guaranteed After-sales Service With the display of mirror dash cam turned off, it's used as a regular rear view mirror while driving. The mirror dash cam is strapped on to the existing original mirror using rubber straps. Professional customer service (support@toguard.cc) will work on fixing any issue within 24 hours. You will enjoy the best shopping experience! 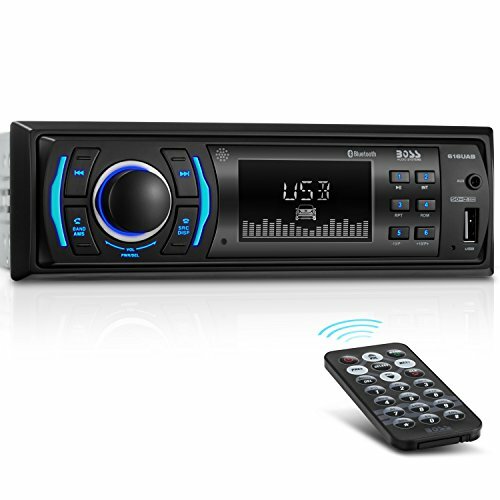 Built-in Bluetooth and microphone, supports hands-free calls and audio streaming with your smart devices for safe driving. Unique design with 2 circular LCD screens for showing more information. Single din vesion, fits most vehicle types.With 2 built-in USB slots, one for charging and the other for music. 2.Please adjust the sensitivity of G-sensor to Medium or Low if your monitor shows "card full" even with loop recording function open. 3.The function of built in 250mAh battery is just to maintain and save settings. Please keep the dash cam plugged in always, or it will keep prompting you to connect the power. This mirror camera can support micro SD card max up to 32GB storage capacity ( NOT included ). Recommended to use Class 10, 16GB or 32GB Micro SD card. Please ensure to use a good quality card and make sure to format the card on monthly basis. Just choose the time for screensaver setting as 30 second,1 minute or 3 minutes after which you could use the mirror dash cam like a normal mirror while both front and rear cams are recording . When mirror dash cam is turned on and there is a moving object in front of the the car, it will automatically record a short video and save it to the card.To save card space, we recommend to turn off the motion detection when driving, as dash cam is already recording. Switching on G-Sensor and parking monitor function will ensure that camera will turn on and record,lock and save video automatically when your car suffers a collision or shake. Monitoring your car 24x7. 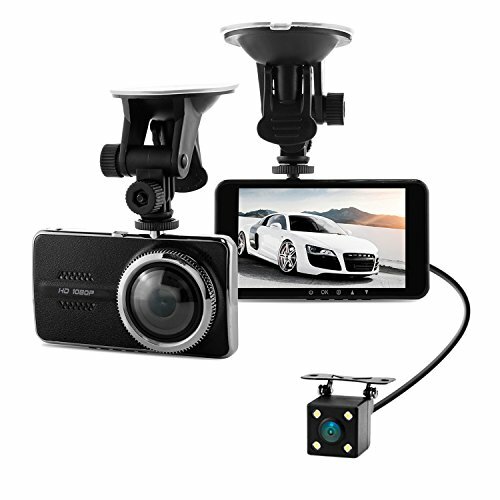 Dual dash cam for front & rear recording :This car camera front and rear simultaneously captures both front video at 1080P and rear video at 480P. The front camera can clearly record the license plates and thus ensuring to get you the best footage. This mirror dash cam features a 5 inch touch screen display for ease of operation making it super easy to control and preview. Reverse assistant for safe parking :Equipped with waterproof rear camera for a rear view with parking guide lines which are automatically activated when reverse gear is engaged. The car reverse camera uses its wide angle lens to provide a maximum coverage for blind areas. This backup camera guides drivers to secure parking areas. Note : Please connect the red wire of rear cam cable to positive power wire of your car reversing lamp. Looping Recording & G-Sensor :This dash cam seamless loop recording overwrites the old footage with new content when the storage limit of card is reached. The mirror dash cam variable sensitivity G-Sensor automatically detects a sudden collision and immediately saves the relevant footage and locks it to SOS file. Thus preventing any overwriting and thereby protecting your video evidence. supports up to 32GB cards.Note : Please do not turn on motion detection of this dash cam while driving. Parking monitor :The backup camera mirror automatically powers on and starts recording as soon as impact is detected, thus providing you a video evidence if your car is scratched by someone in parking. Hence ensuring your peace of mind with complete 24x7 monitoring of your car. 3 Years Warranty & 100% Satisfaction Guaranteed : CHORTAU is a remarkable company and believes in driving innovations to add value to our customers. We offer 3 years warranty with 100% Satisfaction Guarantee. If you have any queries please reach our customer service team (support@chortau.cc) who will immediately respond within 24 hours, providing you the best service. So, go ahead and Add to cart . 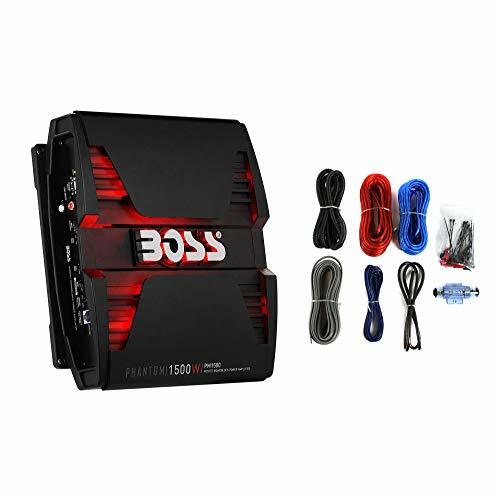 Complete your car audio setup with power and reliability thanks to the Boss Phantom PM1500 1500-Watt 2-Ohm Mono A/B Amplifier with 8 gauge amplifier installation kit. 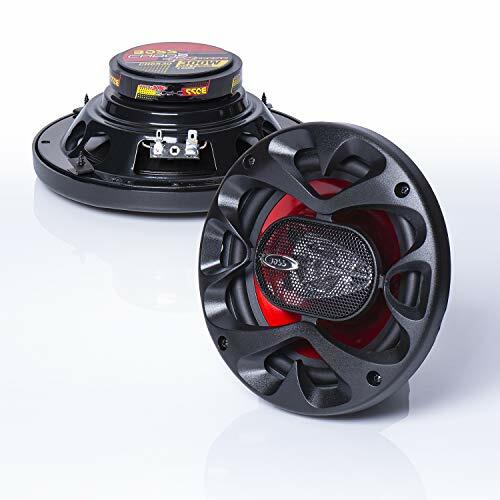 The Boss PM2500 is rated at 563 watts of RMS power at 4 ohms, and has a peak power rating of 1,125 watts at 2 ohms. This amp also features MOSFET power supply, soft start turn on, gold plated low level and high level inputs, 3-way protection, heavy-duty black anodized red lighting heat sink, variable input gain control, 2-ohm stable stereo operations with output power increase, Hi and Low pass filters, and a bass remote control. Great sound starts with great components, and this Boss amp is a great place to start. 10" IPS touchscreen is easy for operation, all can be done by simply swiping your fingers. 1080P high resolution on dual cameras brings you crystal image with details such as license plates,street signs etc. Equipped with F2.0 aperture and 6 glass lens, it can greatly enhances night vision and obtain sharp, color-accurate images.You can clearly read number plates and other important information even at night. 140 waterproof rearview camera provides you with 1080P clear image of what's behind your car. IP68 waterproof standard keeps your rear camera working well in rainy weather. The front lens can be pulled out/in to adjust view flexibly. 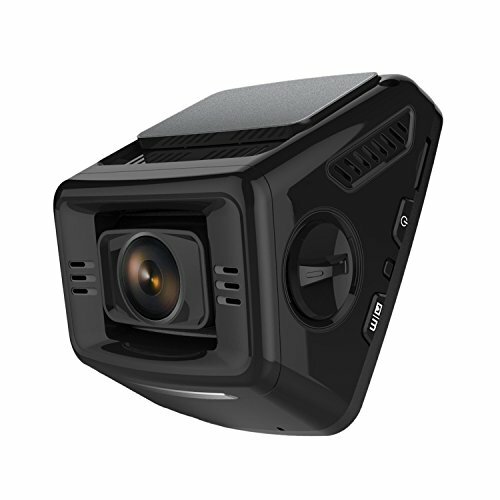 Together with 1080P high resolution and 170 wide angle, it can cover the entire road ahead and captures all the critical details. With the built-in G-sensor, Campark mirror dash cam will automatically lock the current video when collision occurs, which cannot be overwritten even in loop recording. Accident scene can be truly restored. G-sensor sensitivity can be adjusted. Front View Camera:1080P;170 degrees viewing angle;Adjustable. 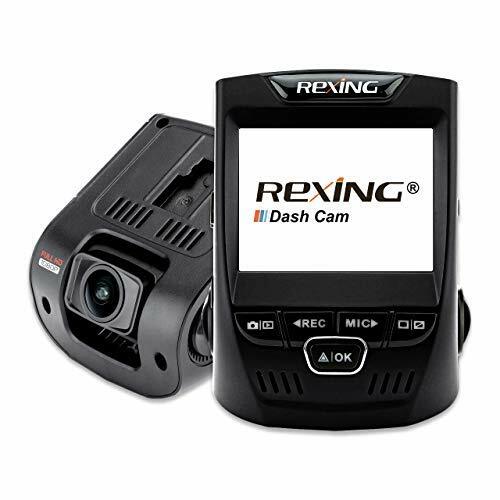 Backup Camera:1080P;140 degrees viewing angle;IP68 Waterproof. 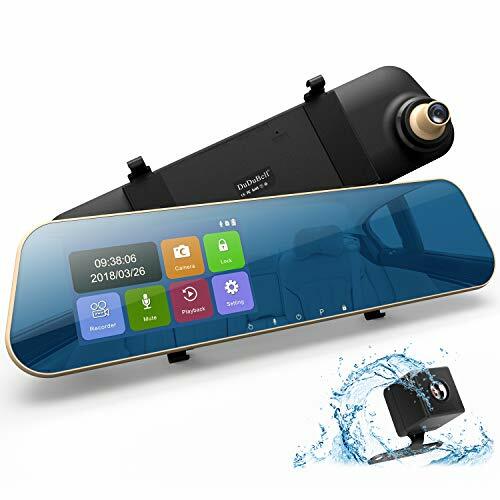 10 Inch 1080P Streaming Media Mirror Dash Cam With the streaming media technology, Campark R10 dash camera features the 10 inch sensitive IPS screen. All operations can be easily navigated by swiping your fingers with touchscreen and it works as a normal rear view mirror after screen saver is on. 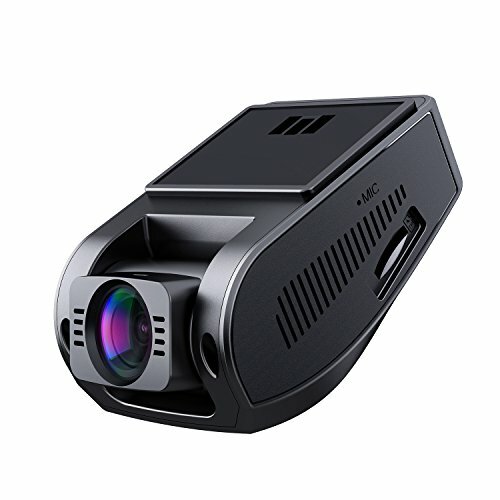 Superior Night Vision & Dual Lens Dash Cam AHD Low exposure rear view camera features F2.0 6-glass lens that greatly enhances night vision.Equipped with IP68 waterproof back camera, no need to remove the rear camera when it rains. Front and rear cameras record at the same time, without missing any one second. Smart Adjustable View Angle Backup Camera When driving,the visual angle is horizontal and you could see farther and wider view behind you.When reversing,it lowers the rear view angle automatically to get a closer and clearer image. No blind spot, no distortion of image, which greatly improve your driving safety. G-sensor & Loop Recording Function When collision occurs,G-sensor will automatically lock the video,which cannot be overwritten even loop recording function is on.Loop recording insure the SD card will never fill up and you will always be able to capture the latest footage. 24H Parking Monitor & Guaranteed After-sales Service The car camera can also standby after parking. When shocking is detected, the camera will turn on and take a video automatically.We guarantee 45 days money back and 12-month warranty and professional after-sale service within 24 hours.